Dave Fiscus is the Director of the U.S. Foreign & Commercial Service‘s Utah Export Assistance Center, where he helps Utah companies compete and succeed in the international marketplace. He’s been with the International Trade Administration for ten years. Greetings from Salt Lake City, home of the 2002 Winter Olympics and one of the fastest growing export markets in the country! 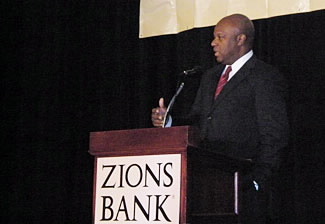 I’m here at Zions Bank’s 8th Annual International Trade and Business Conference. Zions Bank, a corporate partner of the U.S. Foreign & Commercial Service (CS), has assembled a great cast of speakers to address this year’s topic, “Globalization in the Midst of Recession.” Zions Bank’s President and CEO, Scott Anderson, just provided opening remarks, in which the Zions Bank-CS partnership featured prominently (a great highlight for the CS and for the corporate partnership program!). Over 800 members of Utah’s business community turned out for this half day event of presentations from officials representing all sectors of the economy from government to manufacturing to academia. Rick Wade, Senior Advisor and Deputy Chief of Staff for the Department of Commerce just concluded his kick-off remarks. They were spot on with the theme of the conference and very well received by attendees. He pointed out that Secretary of Commerce Gary Locke said in his confirmation hearing that he is committed to “work every day to make the Commerce Department an engine for improving our competitiveness, encouraging innovation, and creating jobs.” Furthermore, he stated that partnerships are a critical component of this goal, and the Secretary and our team intend to strengthen our relationships with business, other federal agencies, and state and local organizations to position the United States as a global leader in exports and innovation. The audience also just heard that last year, exports accounted for 13 percent of U.S. economic growth and supported millions of jobs in the United States. The U.S. exported an astounding $1.84 trillion worth of goods and services. To put this in historical context, exports accounted for nearly 10 percent of our gross domestic product five years earlier and 5 percent 40 years ago. Governor Jon M. Huntsman, Jr., who was recently appointed as the next U.S. Ambassador to China by President Obama, just stopped by to accept Utah’s “Internationalist of the Year Award”. The Governor provided remarks, underscoring the theme of the day. A fitting send-off for a leader who made Utah’s global competitiveness a hallmark of his tenure at the helm of the state. Well, we’re going into a break and my colleague Jeff Hamilton and I need to head over to the Commercial Service Utah table in the exhibitor information section of the conference alongside Trade Promotion Coordinating Committee partners Ex-Im Bank and SBA as well as various local trade multipliers. Russell Roberts, Professor of Economics at George Mason University and Tom Donohue, President and CEO of the U.S. Chamber of Commerce are slated to round out the day’s agenda. Best from the American West!